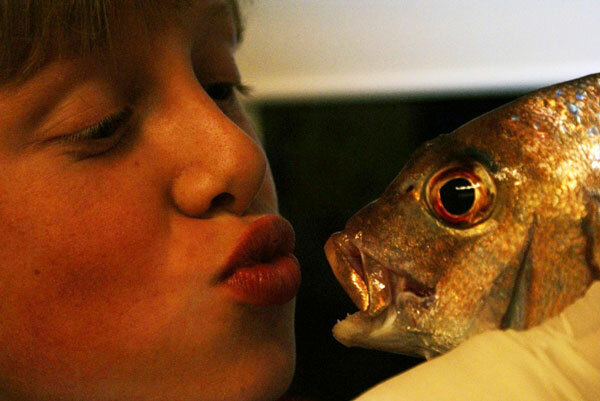 West Coast Snapper Season Arrives Early!!!! 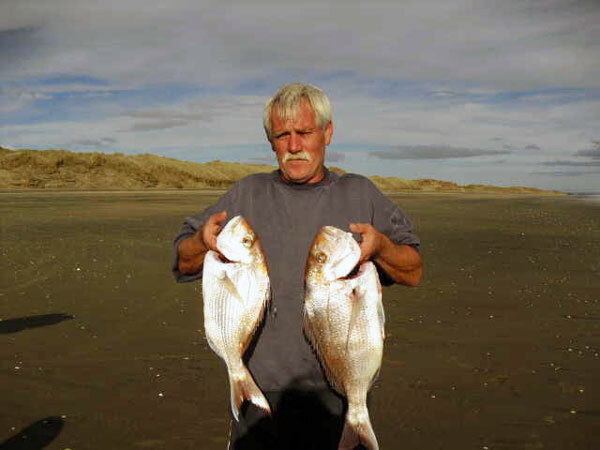 Awesome fishing has been reported from kitefishers fishing Muriwai over the past few weeks. August has always been a favourite month for kitefishers as a good run of big snapper usually arrive at this time of year to fatten up for spawning. 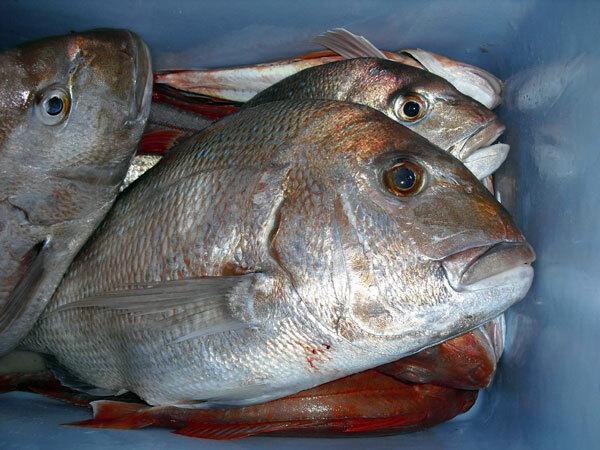 Snapper up to 20lb are often taken this time of year and the good fishing generally continues well into December. 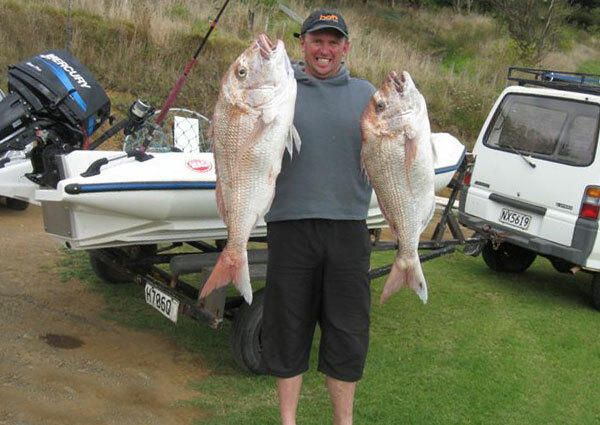 From December through to mid March you can usually expect to catch plenty of pan sized snapper, the occasional 20lb plus snapper, loads of large gurnard and massive hauls of large ocean going kahawai. 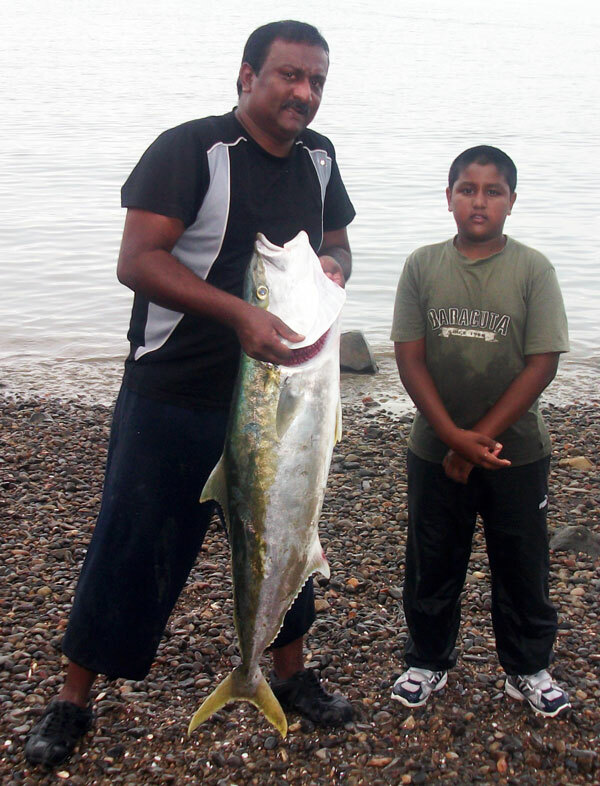 Check out the Historical Catches in our newsletter archive for around this time year, you would be surprised how great the fishing can be during August and September. 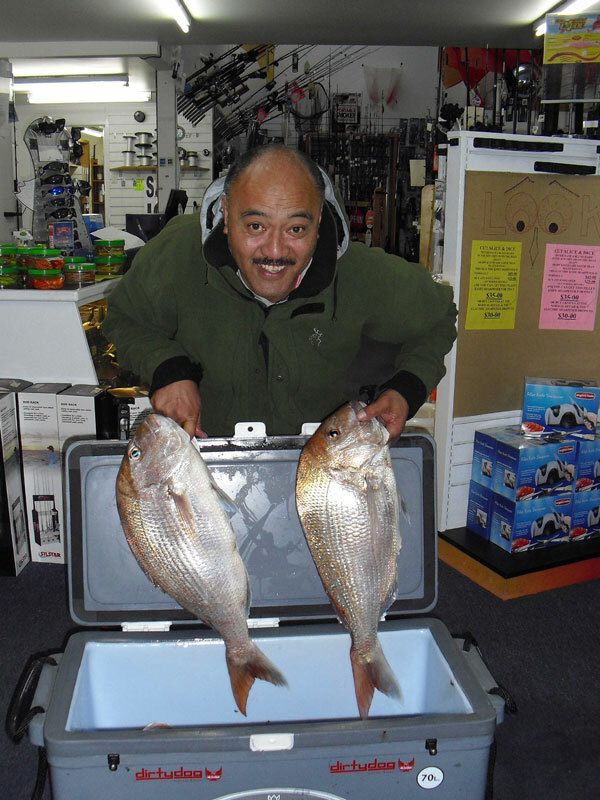 Charles, a regular kitefisher and familiar friendly face in store, headed out to Muriwai on July 21st. Fishing a large 65kg dropper rig just north of Rimmer Road, Charles wound up with this great mixed bag using mullet bait. Luckily for Charles he had Paul’s original winch to haul in the six snapper up to 12lb and 12 gurnard from two sets. Rob took a well-deserved day off on Friday, August 13th and took advantage of the easterlies to do some kitefishing at Muriwai. Using a large 65kg dropper rig, Rob baited up 20 hooks with fresh mullet. Following three sets, Rob and his partner wound up with their bag limit of snapper, and in fact, from the catch on their last set they had to put some snapper back as they had caught too many. They also caught around 18 very large gurnard and several kahawai. The winds were a perfect offshore until mid afternoon, 15 to 20 knot northeasterlies, changing late in the day to blowing straight up the beach. A new comer to kitefishing, Frazer phoned me on August 3rd to report on his most recent kitefishing trip. Frazer had fished his Flexiwing rig a little way north of the creek at Muriwai Beach with his partner and three year old boy. He reported the winds were very fickle and only allowed one set for the day. In order to keep the drag of the gear to a minimum, he set just five double floating bead traces baited up with fresh frozen mullet and left the gear to fish for around 40 minutes. He was over the moon to report four nice pan sized snapper from the five hooks set. There were a number of kitefishers’ at Muriwai on that weekend and reports have been coming in regularly of large snapper up to 20lb and plenty of gurnard. If you’ve had your gear packed away for several months, now is the time to give it the once over. There’s nothing worse than waiting all winter to get out to catch that giant snapper only to find that when you get to the beach the dog’s chewed through the mainline, the cat’s run off with several traces that still had a hint of bait on the hooks, or you had completely forgotten about that 4WD that drove through the gear last year while your mate was using your rig. Paul’s Fishing Kites provides a full service for kite and kontiki rigs. There is nothing that can possibly go wrong with a kitefishing rig that cannot be fixed, repaired or replaced. Give us a phone call or load up the car and bring it in to us. We’d be happy to provide a free quote for repairs. Can’t make into our store? Why not package it up and give us a call. We can arrange a courier to collect from your door, repair your kite or rig, and return it to you with no fuss or bother. Just tested the Two 3 Watt Cree LED Light Gigging Set I bought off you guys and bagged out on prawns. I never seen something so little - that is so bright, I love it so much I just ordered another one, and you should expect more orders in future off my mates. Once they see this baby in action they are all going to want one. 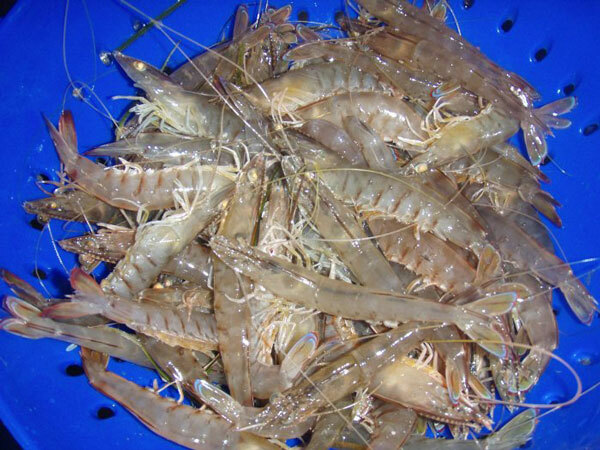 There is no other prawn light this good or of this quality in Australia. My daughter and I caught a bag of 1.5kg in only 45 minutes with the new light. The wife and I are heading away next week to a place called Lakes Entrance, I have been told they are catching huge prawns there so I can't wait to try the light out up there. Please put a few business cards with my last order as I have already had quite a few people pull me up and ask me questions about where to get these lights on my first outing. Everyone here is still towing batteries around with 50w halogen power guzzling prawn lights. There is no comparison - your cree lights blow everything else away! I will try to get some better pics of future catches and of me using the light and will send them your way, thanks heaps. Monday 12 April, 2010 and the alarm rang out at 2:00am, just enough time for a quick cup of coffee before loading the wagon and heading off to Muriwai. We arrived at the golf course entrance at about 3:00am and the low tide gave an easy drive to around 35km's up the beach. We parked in one of the many gaps in that area (no, I'm not going to give away my exact spot x). As daybreak arrived the conditions looked perfect. There was a slight offshore breeze blowing and it took us about 15 minutes to get the Mega Mouth fishing kite airborne. Unfortunately the winds were so light that the gear wouldn't go past the back breaker so we decided to let it fish where it laid. It was a good decision because our first haul returned six snapper and two gurnard, a good start for the day. The second set managed to get out a bit a further as the wind had only just slightly increased. As the gear got out just past the last breaker though the winds dropped again and, as we watched the mega mouth slowly losing altitude, we hurriedly retrieved line and managed to get the kite back to full height. This set was better than the first with 11 snapper, two gurnard, a spotted dogfish, one trevally and a stingray which was returned unharmed. The wind continued to die on us so we took a break, it was another one and a half hours before the wind was steady and strong enough to attempt another set. We managed to get in another two sets for the day, but due to the fickle winds, they were all set around the back breaker mark. Our total catch for the day was two stingrays (one absolutely massive one that I had to drag back to the surf very cautiously and cut the clip from the trace to set it free), one trevally, one dogfish, two sharks, five kahawai and 29 snapper. Although all snapper were legal sized, we released 10 of the smaller ones, plus the sharks, dogfish, and stingrays as everything was lip hooked and alive. 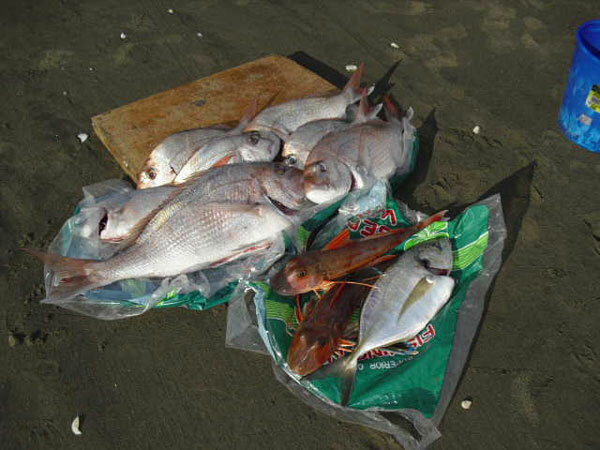 Six snapper and two kahawai were given to another kite fisher who hadn't been as lucky as us. We were fishing a 65kg Dropper Rig baited with fresh mullet, and it might pay to mention, that I only use 5/0 Target Snapper Hooks as I tend to mainly fish the west coast and this size hook works best on the big fish out there. Just out of interest too, the 5/0 Target Hooks work so well that only one of the gurnard caught on this day had swallowed the hook. 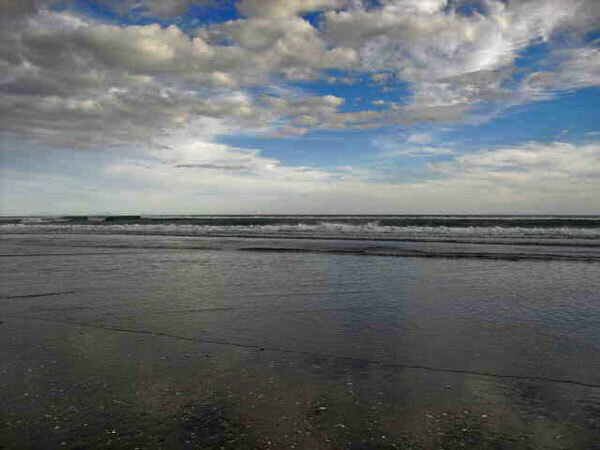 On a late February morning the winds were perfect for kite fishing at Muriwai Beach. I left home as dawn was breaking and made my way onto the beach at the golf road entrance. As it was right on high tide I set up the Bottom Longline Kite Rig near the entrance to fire out a shot while I waited for the waters to recede. My thinking was, if the fishing was good here then there would be no need to move later. The first set resulted in just a couple of small snapper and a shark so I decided to pack up and move. As the tide began to turn I drove around 30 kilometers up the beach. Alas, another kite fisher had beaten me to my favourite possie so I had a few extra kilometers to travel before settling on a spot. I fished a Bottom Longline Kite Rig baited with fresh saltwater mullet. I find saltwater mullet to be a vastly superior bait to mullet caught in freshwater. From four sets in total I caught six snapper around the 1.5 to 2 kg with one 7kg beauty, four sharks (released), four undersized snapper (also released), 13 large kahawai, and six gurnard. Apologies for the quality of the pic, it was taken on an old cellphone. New Years Eve 2009 and after a rubbish day at work, we were in a small plane on our way to Great Barrier Island. As we approached, the last big decision of the year had to be made – do we spend the last hours of daylight at the family batch with my three under 6 year old nieces, or do I grab my lady, the kite and some cold beers and go to the beach? In reality, the decision had already been made the day before, providing the southwesterly continued, which they had, so away we went. Whangapoa is a two kilometer long east facing sandy beach at the northern end of the island. It is a stunning untouched beach, which isn't hard to get to, yet we frequently find it all to ourselves. We had seen several large sharks in close from the plane on the way in, so with no surf and clear water, we set our Flexiwing, with Skyhook about 500 meters out. After my customary beer and a brief attempt to solve the problems of the world, we hauled in nothing - though the trailing hook had been chewed off by what we liked to think had been a decent snapper. With an increasingly beautiful evening, a beach to ourselves, and a bag of beers, there was no doubt that we would set again. It wasn't exactly a huge success, though the trailing hook did snare a rather angry 8lb snapper in prime condition.I don’t normally keep fish over 7-8lbs but decided to take this one for the smoker and thus preserve my "provider" status with the family. Day 2 of 2010, the southwesterly returned and the prospect of a sunny afternoon at the beach with a few cold ones and good company was too good to miss. After considerable debate, we set around the same distance, had a swim and beer, solved absolutely no global issues, and then hauled in 10 untouched hooks. 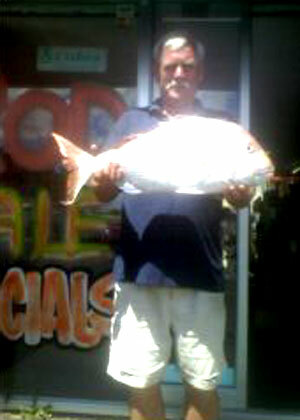 Our 10 hooks yielded seven prime snapper from 2-10lb. The largest was in great condition and relished its return to the sea. Another round of heated debate ensued as to the length of our last set. I thought the results of the previous set should have made that clear but my brother was adamant that we should go further. Though none were pushing double figures, we were grateful for another six fat snapper, all of which were full of freshly crushed shellfish. Had we found some prime snapper grounds? Or was it just dumb luck? I don’t know, I’m not a fish, but we will be back soon for another go with our trusty Flexiwing, because fish or no fish, we love it and that’s why we do it. I caught this big kingfish while surf casting for snapper off the rocks at Arran Bay on Waiheke Island. I was using pilchards as bait on 15kg line from a Shimano Torium reel and a 12 foot rod. I hooked three other kingfish like this one but lost all the others. I was lucky to land this one as it took about 40 minutes of hard fighting to tire the fish out. One of the boats nearby came in and the guy weighed it with his scale and said it was near 27kg. We stayed in the Villa at Waiheke. Hi All, Had a great day in fishing in the boat during March. The big snapper here tipped the scales at 12.41kg and was taken on the fishing rod. We caught the ones above plus a 9kg Snapper (mokau pannie, lol) and other snapper and gurnard. Hi - I'm the owner of garbagefish.com and I enjoyed your shark cleaning pictorial. Here's a recipe I enjoy. We catch a lot of smooth dogfish here in the Mid-Atlantic. As soon as caught, I collar it, gut it, then skin it - and after removing the back bone, then I wash it out and thoroughly ice it. For cooking, I'll cut them into small steaks or chunks, marinade them in a sweet teriyaki for an hour or two, then wrap them in bacon. I cook the bacon slightly before wrapping. After that, I'll grease up the grill and cook them in a fish basket right on the grill for a couple minutes each side until done. If they are big enough, I'll put them right on the grill. So delicious, but most people don't know as the majority of dogfish caught in our area are tossed back as junk fish. Thanks for sending us the Kayak Longline and the Floating Beads. We managed to get out tonight at about 7pm and try the rig for the first time (8pm) and here's a photo of my husband and two of our sons, the oldest hiding his broken arm! We tried long pieces of defrosted squid as bait. We set ourselves up a location we found on your website lined up between the green marker off Browns Bay coast and the Sky tower and the Browns Bay boat ramp. We left the long line there for 30 minutes and paddled away. When we came back and lifted the line, all the bait was gone, and sadly, no fish! But we enjoyed the adventure all the same. So do you think it was just bad luck or maybe I cut the bait too long or didn't bait it right? Some of them were squid heads, while the other pieces were halves of the squid body. I had tied one red floating bead to the top of each hook eyelet, above the hook and theoretically out of the way. We caught only a tiny bit of seaweed on two hooks. Should we try a different bait or location out behind the green marker next time? 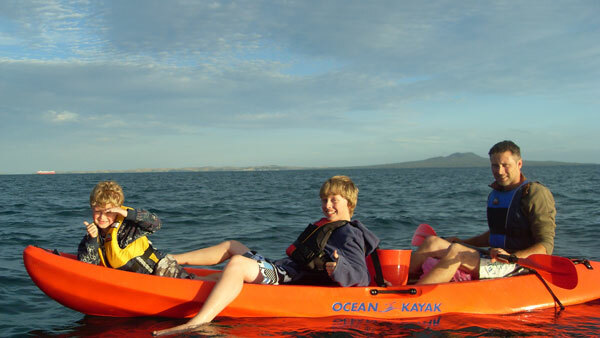 We didn't paddle the kayaks out as far but stayed in the bay of Browns Bay as the water was a bit too choppy for our liking with the kids.I had threaded two floating beads on each trace instead of just the one. I'd also threaded the hook right through the bait and back out the other side again as per instructions on your website. We dropped the line in then paddled in to shore for a coffee and hot chocolate while the kids played at the playground. Then my husband and oldest son went out to retrieve about 45 minutes later. There were two legal size 30cm snapper (mouth to inside V on tail) on the two hooks that had squid. The hooks were just in their mouths and they hadn't swallowed any bait. The boys were thrilled and took them home. We now need to perfect our skills at filleting but we managed fish fingers for supper with flour and mixed herbs! Yummy! As you can see from the photo above, Jacob was so happy to catch fish with a broken arm, he could have kissed the fish! We'll go out deeper next time and use fresh squid.